So, I have decided that while I can make one heck of a delicious cake, I cannot make them pretty. Seriously! It is so frustrating. As much as I try, I guess it's just not my thing. Perhaps it's a patience thing? I just keep telling myself that as long as it tastes good, that's all that really matters. Maybe I'll believe that one day. This cake is the perfect example. It tastes so darn good, but I could not get the "ombré" effect that I was really going for. The frosting wasn't cooperating like it should, and the darker color was taking over the middle color. Ugh. And, I always forget to rotate my cakes while baking, so one side is always higher than the other, due to poor heat circulation in the oven. Besides my lack of ability to make a pretty cake, it still tasted delicious. That's what counts, right? Moving on to business, allow me to break this cake down for you. 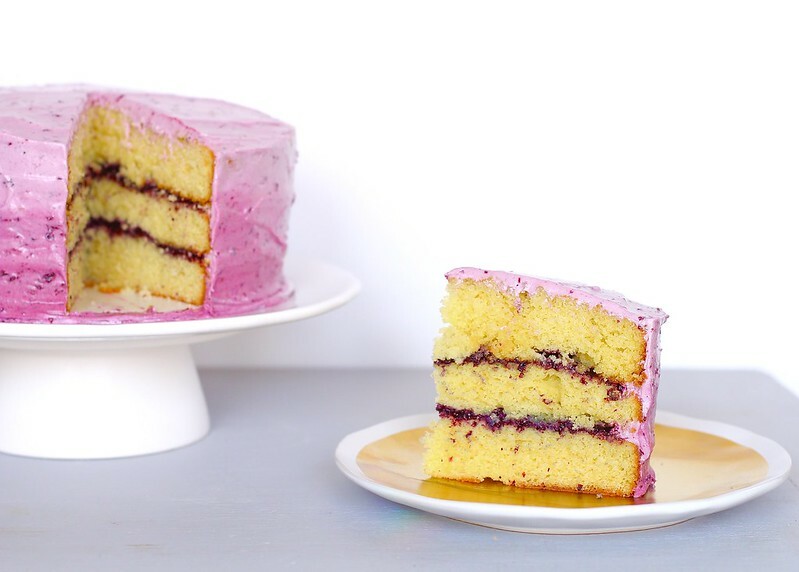 First, I made my go-to yellow cake recipe, then a small amount of homemade blueberry jam is created, which is slathered between the cake layers, as well as mixed into a creamy, simple cream cheese frosting. 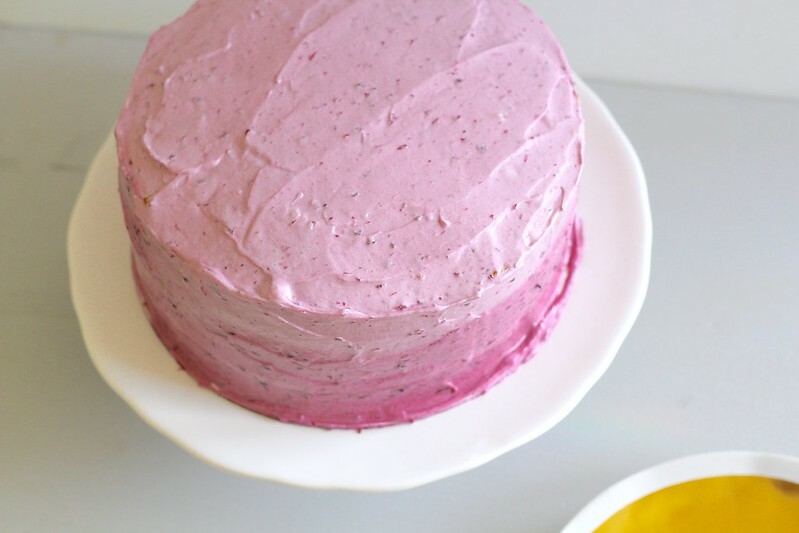 It's rather a simple cake, especially if you decide to forgo the 'ombré' effect. You can even make it easier on yourself and get good quality store-bought blueberry jam. Easy peasy. To make the cake; grease three 8-inch cake pans and dust with flour, tapping out the excess. Set aside. In the bowl of an electric mixer, beat the butter and sugar together until light and fluffy, about 3 minutes. Add the eggs, one at a time, and beat well after each addition. Beat in the vanilla extract. In a separate bowl, whisk together the flour, baking powder, baking soda and salt. Alternating with the buttermilk, stir the flour into the butter mixture, ending with the flour mixture. Beat until just combined. Pour into the greased pans, smoothing out the top. Bake until golden and a toothpick inserted into the center comes out clean, about 20-25 minutes. Let cool for 10 minutes before turning out onto wire racks. Let cool completely before assembling. While the cake is cooling, make the frosting. In the bowl of a stand mixer fitted with the paddle attachment, beat the butter and sugar on medium-high speed until light and fluffy, about 3 minutes. Add the cream cheese, one piece at a time, beating well between additions. Beat in the vanilla extract and 2 Tablespoons of the strained jam. Mix until completely incorporated. Transfer 1/3 cup of frosting to 2 bowls each. Mix in 1 teaspoon of the strained jam to one bowl until completely incorporated, and 1 tablespoon of the strained jam to the other bowl. You should have three shades of frosting now. To assemble the cake, place one cake round on desired serving plate. Spread a thick layer of the unstrained jam over the top. Place second cake round on top of jam and repeat. Place third cake round on top and spread a small amount of the lightest colored frosting over the top and sides of cake. 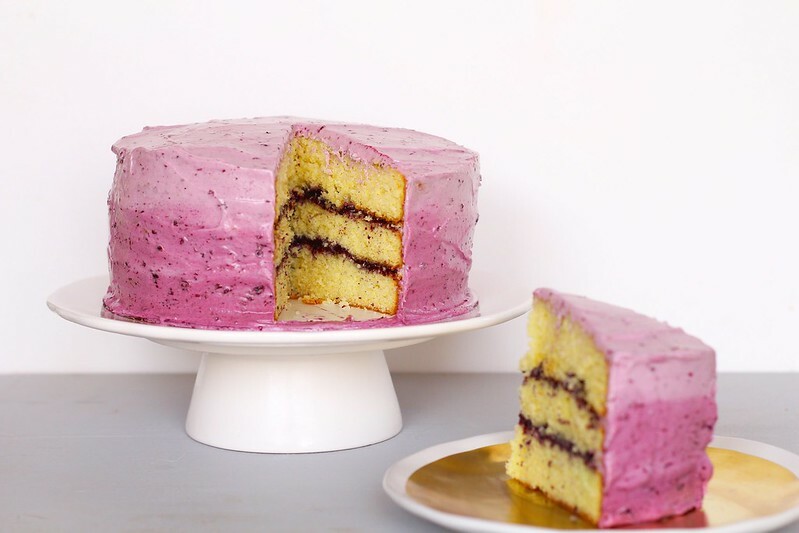 Starting at the bottom, spread darkest colored frosting over bottom third of cake. Then, spread medium-colored frosting over the middle third of cake, and lightest colored frosting over top third and very top of the cake. 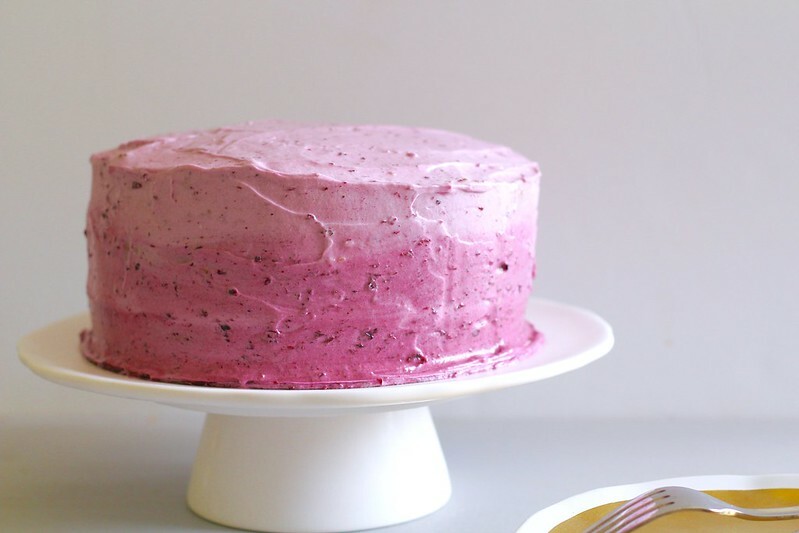 Run a rubber spatula from the bottom of the cake to the top to blend the frostings. Serve.